For all you Mexican food lovers these Crock Pot Chicken Fajitas will quickly become a new favorite. The flavors are incredible with the bell peppers, onion and an assortment of Mexican spices. The fresh lime juice and honey you throw in at the end make these extra good, so don’t skip that part! 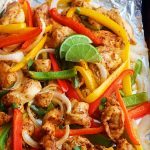 These fajitas are such a delicious and healthy meal you can throw together in the morning and enjoy in the evening with hardly any fuss! 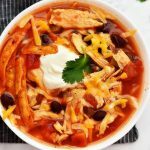 Delicious chicken fajitas slow cooked in a crock pot! Pour half of the canned tomatoes in bottom of crock pot. Spread in an even layer. Top with half of the peppers and half of the onion slices. Sprinkle garlic in. Top with chicken breasts. Sprinkle the chili powder, cumin, paprika, salt and pepper over chicken breasts. 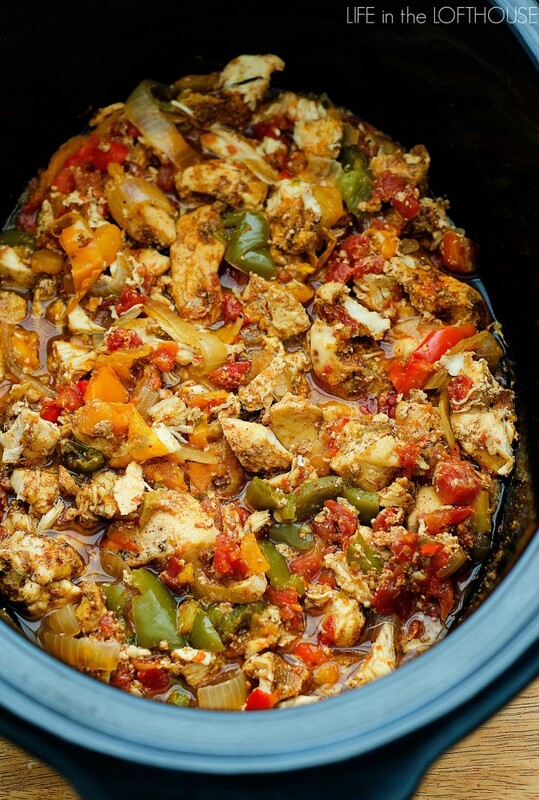 Top chicken with remaining canned tomatoes, peppers and onion. Cover and cook on LOW heat 6 to 8 hours, or on HIGH heat 3 to 4 hours, until chicken is cooked through and veggies are tender. Remove chicken and shred. Ladle out 1 or 2 cups of broth from crock pot and discard. In a small bowl whisk together lime juice and honey. Add to crock pot along with chicken. Gently toss to combine. Serve warm in tortillas with desired toppings. Enjoy! 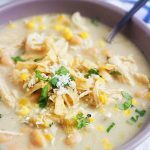 This looks and sounds amazing – I love my crock pot, too! I loved this recipe. The only thing I did different was I sautéed the peppers & onions separately at the end instead of adding them to the crock pot so they wouldn’t be too soggy. I’ve added them in the CP in the past and that has happened. I also loved the honey and lime flavor and that it wasn’t too spicy. I will def make these again! I started this yesterday morning and my fiance and I had it for dinner last night…It was absolutely amazingly delicious!! We like spice so I added a jalapeño. Thanks, definitely will make again! Absolutely amazing recipe. I have made this twice in the last week and I have it cooking right now. My family enjoyed it so much. The chicken turns out so good you can make anything with it, tacos, burritos, enchiladas just wonderful. 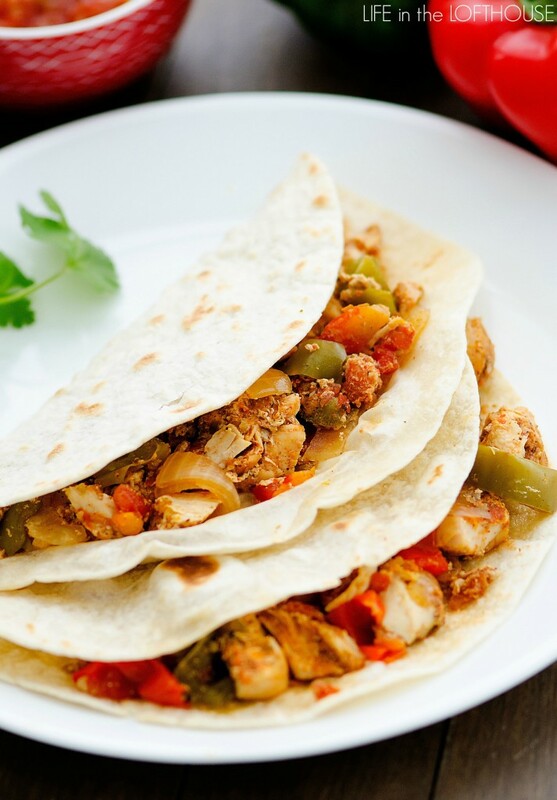 These Crockpot Chicken Fajitas are easy to prepare, and make the most delicious dinner! Serve them up with all of your favourite toppings! Made this tonight. We loved it. Super easy & delicious. Thanks for sharing! My gang really loved this last night, so did I. Have leftovers for today. A nice change. 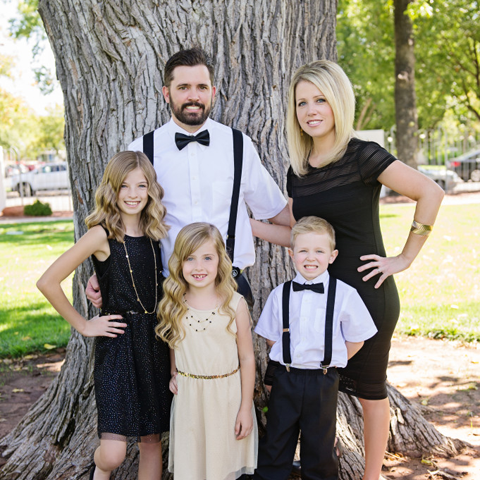 I’ve hooked my niece up with your site.We love your recipes. My grandson loved this. will be making this again,often. I only added an extra can of diced tomatoes. A great hit! My daughter is extremely allergic to tomatoes, but being that fajitas is one of my favorite foods I wanted to try this. I made it last week and it was amazing! I left out the tomatoes but added 2 cups of chicken broth. I made rice, and added black beans and corn and we actually ate it as a soup. I am making it again tonight because my parents are coming in from the west coast during the time I will be at a work meeting. My stepdad hates soup, so he can have fajitas while we eat it as a soup. It’s so versatile and delicious! I rarely leave comments but I am shocked at how few have left comments for this amazing dinner so I had to leave mine. This dinner is sooo easy and amazing delicious. Full of flavor. We made guacamole, rice and beans and everyone created and loved their wrap. HIGHLY RECOMMEND and thank you for posting this and making my life just a little easier. Much love and god bless! Making these for the second time in 2 weeks. It’s our new go to chicken dish. We made tacos & taco salads with the leftovers. This went great with homemade pickled red onions & avocado. Really a fantastic (and easy!) recipe. Thanks! I used boneless chicken thighs in place of the breasts, and when it came down to it, I couldn’t bring myself to discard two cups of that wonderful spicy broth-so I served this as soup! Big hit in my house-next time I will try this as a stovetop dinner. This is in the crockpot now! I can’t wait! Your shepard’s pie recipe is the BEST! One question on the fajitas, have you tried to prep and freeze this to cook later? 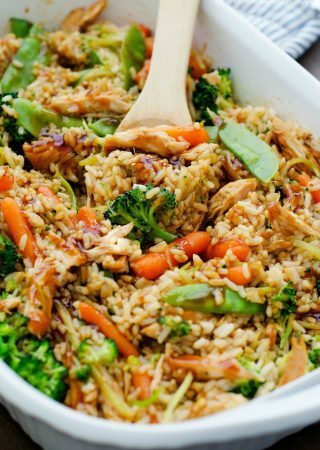 Looking for some yummy, easy dump dinners! How important is the layering? Can this recipe be frozen as a dump dinner for later use? How important is the layering? I’ve got it in the crockpot now and it smells so good!! I’m sure it will be delish and I’d love to make a few dump dinners for the freezer! Please let me know if you have tried that!